Customization – keyboard and color options. Interactivity – events that can be listened for to provide interactivity. <Editor Text="This is a read-only Editor"
The IsReadonly property does not alter the visual appearance of an Editor, unlike the IsEnabled property that also changes the visual appearance of the Editor to gray. A MaxLength property value of 0 indicates that no input will be allowed, and a value of int.MaxValue, which is the default value for an Editor, indicates that there is no effective limit on the number of characters that may be entered. Disabled indicates that automatic resizing is disabled, and is the default value. TextChanges indicates that automatic resizing is enabled. When auto-resizing is enabled, the height of the Editor will increase when the user fills it with text, and the height will decrease as the user deletes text. An Editor will not auto-size if the HeightRequest property has been set. Chat – used for texting and places where emoji are useful. Default – the default keyboard. Email – used when entering email addresses. Numeric – used when entering numbers. Plain – used when entering text, without any KeyboardFlags specified. Telephone – used when entering telephone numbers. Text – used when entering text. Url – used for entering file paths & web addresses. Examples of each keyboard can be found in our Recipes repository. None – no features are added to the keyboard. CapitalizeSentence – indicates that the first letter of the first word of each entered sentence will be automatically capitalized. Spellcheck – indicates that spellcheck will be performed on entered text. Suggestions – indicates that word completions will be offered on entered text. CapitalizeWord – indicates that the first letter of each word will be automatically capitalized. CapitalizeCharacter – indicates that every character will be automatically capitalized. CapitalizeNone – indicates that no automatic capitalization will occur. All – indicates that spellcheck, word completions, and sentence capitalization will occur on entered text. The IsSpellCheckEnabled property controls whether spell checking is enabled. By default, the property is set to true. As the user enters text, misspellings are indicated. When the IsSpellCheckEnabled property is set to false, and a custom keyboard isn't being used, the native spell checker will be disabled. However, if a Keyboard has been set that disables spell checking, such as Keyboard.Chat, the IsSpellCheckEnabled property is ignored. Therefore, the property cannot be used to enable spell checking for a Keyboard that explicitly disables it. 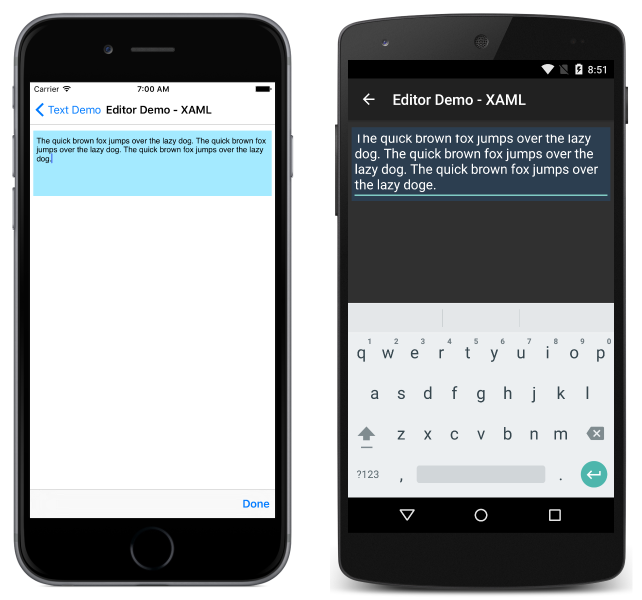 The IsTextPredictionEnabled property controls whether text prediction and automatic text correction is enabled. By default, the property is set to true. As the user enters text, word predictions are presented. When the IsTextPredictionEnabled property is set to false, and a custom keyboard isn't being used, text prediction and automatic text correction is disabled. However, if a Keyboard has been set that disables text prediction, the IsTextPredictionEnabled property is ignored. Therefore, the property cannot be used to enable text prediction for a Keyboard that explicitly disables it. Editor can be set to use a custom background color via the BackgroundColor property. Special care is necessary to ensure that colors will be usable on each platform. Because each platform has different defaults for text color, you may need to set a custom background color for each platform. See Working with Platform Tweaks for more information about optimizing the UI for each platform. Make sure that the background and text colors you choose are usable on each platform and don't obscure any placeholder text. TextChanged – raised when the text changes in the editor. Provides the text before and after the change. Completed – raised when the user has ended input by pressing the return key on the keyboard. The VisualElement class, from which Entry inherits, also has Focused and Unfocused events. var text = ((Editor)sender).Text; // sender is cast to an Editor to enable reading the `Text` property of the view. The TextChanged event is used to react to a change in the content of a field.